Background Src has a critical role in tumor cell migration and invasion. Increased Src activity has been shown to correlate with disease progression and poor prognosis, suggesting Src could serve as a therapeutic target for kinase inhibition. Saracatinib (AZD0530) is a novel selective oral Src kinase inhibitor. Methods Metastatic colorectal cancer patients who had received one prior treatment and had measurable disease were enrolled in this phase 2 study. Saracatinib was administered at 175 mg by mouth daily for 28 day cycles until dose-limiting toxicity or progression as determined by staging every 2 cycles. The primary endpoint was improvement in 4 month progression-free survival. Design of Thall, Simon, and Estey was used to monitor proportion of patients that were progression free at 4 months. The trial was opened with plan to enroll maximum of 35 patients, with futility assessment every 10 patients. Results A total of 10 patients were enrolled between January and November 2007. Further enrollment was stopped due to futility. Median progression-free survival was 7.9 weeks, with all 10 patients showing disease progression following radiographic imaging. Median overall survival was 13.5 months. All patients were deceased by time of analysis. Observed adverse events were notable for a higher than expected number of patients with grade 3 hypophosphatemia (n = 5). 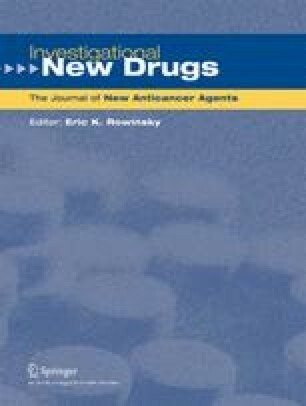 Conclusion Saracatinib is a novel oral Src kinase inhibitor that was well tolerated but failed to meet its primary endpoint of improvement in 4 month progression-free survival as a single agent in previously treated metastatic colorectal cancer patients. This study was presented at AACR 2008 and funded by the National Cancer Institute (NCI Protocol #7565, NSC735464).